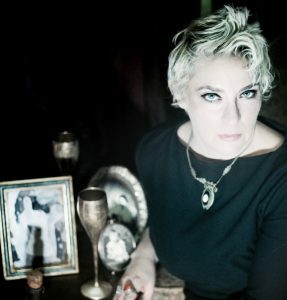 Your book, Varla Ventura’s Paranormal Parlor: Ghosts, Séances, and Tales of True Hauntings seems like a return to the old days of telling the story, or letting the witness tell the story. Why does the idea of ghosts and hauntings resonate with readers? I think we all love a good scare, or many of us do. And we also love a good mystery. Life after death? That’s the ultimate mystery. For some of us it’s pure amusement, for others it’s a lifelong pursuit to determine if their own experience is valid. What’s your favorite part of the haunting phenomenon? I think for me, the personal experiences I’ve had reaffirm my belief that the world is not a simple, linear place but that there are many layers and experiences happening at the same time. And the more I see/feel/experience the more I understand the experiences of others. In terms of storytelling, or a setting, or a place for investigation, there is nothing like the classic haunted house. Creaking floorboards, tattered wallpaper, the shadows of happier times. I enjoy learning about haunted places and homes but I’m even a fan of the cheesiest, corniest haunted house rides. In both fact and fiction, there’s something about the appeal and mystique of a place that is supposed to be safe (home) becoming your worst nightmare. It’s relatable but terrifying, but you can’t. look. away. In your new book you share the tales of others, but also some of your own encounters with the unexplained. Can you give us an example of an early personal experience that helped cement your love for things that bump in the night? As a kid, I grew up picnicking in cemeteries, dabbling with the Ouija and Tarot before I turned 10, and living with Halloween decorations around the house year round. There was an accepted attitude of magic and witchery that was not in association with a cult or a group, but rather in the old world ways of “this is how it is.” We watched classic horror, were fans of Frankenstein and never shirked away from a gory scene. So my basic setting was a bit of magical herbalism, sprinkled with psychic tendencies and a big dose of Addams family. In the book, I talk about a Ouija experience I had, I was about 7 years old. My sister (aged 8) and I made contact via the Ouija board with the spirit of a little pioneer girl whose loan grave was discovered alone in the woods, not far from my family’s house. My mom had given my sister and I the board for Christmas, and I think she underestimated the likelihood of us making “contact.” The look on my sister’s face when “correspondence” really began…it told me she was too freaked out to be the one moving the planchette. And I knew I wasn’t moving it. But it was definitely moving. I remember being fascinated and wanting to do it more. My sister remembers being freaked and wanting to stop. My mom came in and asked who we were “talking” to. When we told her the name of the dead girl she kinda flipped out and quickly took the board away. I never saw it again, but that was hardly my last experience with it. Have your personal experiences led you closer to any organized religion, or further away? I like to say I am a supernaturalist: I do believe in spooks! I think perhaps my upbringing is unique in that I was not raised with a particular religion, yet I was not raised biased for or against any religion. So often it’s one or the other. (Not that there haven’t been attempts to “convert” me over the years.) Overall, I believe in magic, and I believe in stories, and isn’t that the basis for any religion? But will you find me in a Sunday hat in church? No sir, you will not. What can we learn from sharing ghost experiences with each other? We learn the art of story is an intimate experience. For example, you and I have been acquaintances over the last several years, but when you shared your story for my book, I felt a great connection to you. Not only was I grateful that you agreed to share it, but the story you chose and how personal it was to you–it changed the nature of our discourse. I still see the shadowy Parisian catacombs every time I think of you. I went on a journey with you, as do readers and listeners, and that journey, getting lost in the story, is a great letting-go. Just as we do with close friends and partners, we get “intimate” enough to trust and let go. With ghost stories, especially, we journey to the end of something that makes our pulse quicken and palms sweat, bonding the teller and the listener all the more. And of course, I have found by and large, once you share a story then you are more likely to get a story in return—there’s an affirmation in sharing these ghostly tales that help us (perhaps) better understand the supernatural, or solidifies our belief in our own paranormal experiences. The paranormal book market has been shrinking for years. A decade ago there were dozens of books on the shelves on everything from ghost investigation to psychic development, to haunted places, and the occult. What’s changing in the market? Perhaps we have a more discerning reader. That rather than looking for self-improvement through the paranormal arts, our reader requires more evidence and a higher entertainment value to be drawn away from the likes of Stranger Things or Black Mirror. In the ‘90s and early 2000s, it wasn’t unlike ‘60s, where topics like astral projection and tarot reading were produced in mass market paperbacks and became commonplace. Perhaps in the 2020s-30’s we’ll see another fever pitch. And in the realm of the occult, to me there seems to be a split in two directions: one– a shifting away from the guru mentality (I will follow you) toward the self empowerment as part of a greater movement (you can make a magical difference) and two—fewer “serious” books produced, but those that are have a higher production value, include more advanced magical work and often use magic in the book-making process. Ghost stories and experiences have been shared for many decades around campfires and at children’s sleepovers. Today they proliferate on the Internet and on mass media. Do you think technology is changing the nature of the ghost experience and how and why we share it? This is a glass half-full scenario. On the one hand, (the half-empty side) you have a flood of information that may or may not be true, presented at your fingertips based on an algorithm determined by robots (Google search: most haunted cemetery near me). On the other (half-full) you have a proliferation of stories being shared by people who experienced them, regardless if they are professional storytellers, have a platform or a venue to share their story. The comments, call-ins and messages I receive from readers about their experiences are sometimes my favorite things of all. Technology has always played a hand in the way we think of ghost stories. The Spiritualist movement began in the 1840s and went through the 1930s or so. This was the widespread belief that the dead could communicate with the living from the afterlife, and that they had something to tell us. Imagine how people who had corresponded all those years by letter (sent via steamer or train) felt when they could pick up a small device in their home and hear a disembodied voice (telephone) or when the first radio appeared on their block. And now we have Podcasts! Full of freaky stories and legends! Right in our little pocket computers. I fall asleep listening to them most nights. What’s the secret to making the perfect s’more? Visit Varla Ventura’s Web site here. This was a super fun Interview to read. Very interesting and informative. Some pretty awesome childhood memories came forth for me while reading. Great job Jeff and Varla. One thing you can cross off the Bucket List !